Like the Kit Kat before it, here’s a familiar American brand gone east. You can even visit their site here if you have a little time. I don’t have any cool info on Bubblicious though because the site is mostly in Japanese and I still don’t read it. Alas. It’s been a long time since I chewed a Bubblicious but from what I can remember they were squares of sugary bubblegum goodness (I was a big fan of the watermelon) that blew a decent bubble. These are less sugary than I remember from my childhood but not by much. Maybe they have a finer sugar crystal crunch or something like that because they certainly have the sweet but aren’t as crunchy with it as I remember. I’m pretty sure though that if you chewed a lot of these you would be your dentist’s best friend so even if they are less sweet than the gum of yore it’s not by a whole lot. I’ll confess that I find munching on nutty gum (for maron is chestnut in Japanese) a little strange. What’s even stranger is that I wouldn’t have pegged this for chestnut if I hadn’t known ahead of time. I can taste a little caramel, a little mocha and just a tiny titch of Flavoring #39 but not especially anything nutty. Maybe. Odd. But what it does taste of mostly is sweet. I’m kind of a gum purist and find gum that is not mint, fruit or cinnamon vaguely weird to chew. On a personal note, I’m not sure I like the flavor much but realistically it’s not particularly bad. It’s just not watermelon or lemon or whathaveyou. If you have no problems with odd sweety flavored gum than disregard my grumps about the chocolate/caramel/sweety/FLAVORED taste. I will still take some pea points off for not being especially chestnutty. Unless chestnuts taste like chocolate caramel mocha FLAVOR in which case it’s spot on. 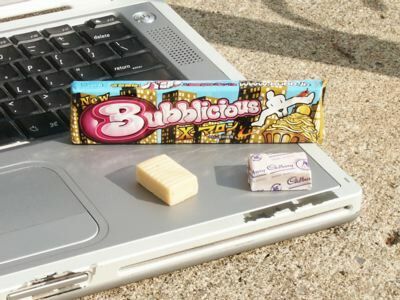 As for chew, this Bubblicious has the same bubble power as the gum of my youth. By far the best bubble blowing gum had to be Bubblicious or Hubba-bubba…you could blow monster bubbles with either. Same for Bubblicious Japan. Thumbs up for a smooth chew and wikid bubble power. Lastly, I want to mention the wrapper. Did Bubblicious always come in a wax lined bubble gum wrapper? I can’t remember rightly but it seems novel to me. It even has a little DON’T LITTER trash man icon inked onto the wrapper. Hee! Also? Cadbury. I had no idea Cadbury was affiliated with Bubblicious but I’m good with that. Very good with that. Cadbury…yum. Ooh! Do you have any of this left? I still kinda want to try it…. It’s just as [ insert value here ] as promised! Thanks! It does taste similar to the same “generic nut” flavor that the Pocky had. That must be “chestnut” flavor….